In Fresh Hope … Cleveland author Nanci Gravill shares information and the successful strategies that helped her navigate through five years of difficulties. People think because she had breast cancer her book’s about cancer. “Oh no!” she tell them astonishingly. Fresh Hope … Cleveland is all about the great things she discovered along her journey. It’s all about RESOURCES. Fresh Hope … Cleveland gives ideas on how to s-t-r-e-t-c-h your dollars along with creative living ideas that will inspire you. In a sense the book provides wisdom at a time when you may need it most. Waiting for answers and opportunities to arrive is part of life. But how will you wait? How will you cope? This practical guide and workbook gives you some inventive ways to manage those challenges along with healthcare services, job and mortgage information, emergency contacts, prayer hotline numbers, books, classes at local churches, and much more. Find out too, about the most important resource you could ever possess: a relationship with God. Fresh Hope … Cleveland is published by WestBow Press, a division of Thomas Nelson Publishers. Look for the eBook ($3.99) and soft-cover, printed version ($19.99). Fresh Hope …. Cleveland is available by ordering at your local bookstore (ISBN #978-1-4497-3011-6), on the publisher’s website at westbowpress.com, on Amazon.com, at your local public library, and soon to the author’s new website (nancig.com)! 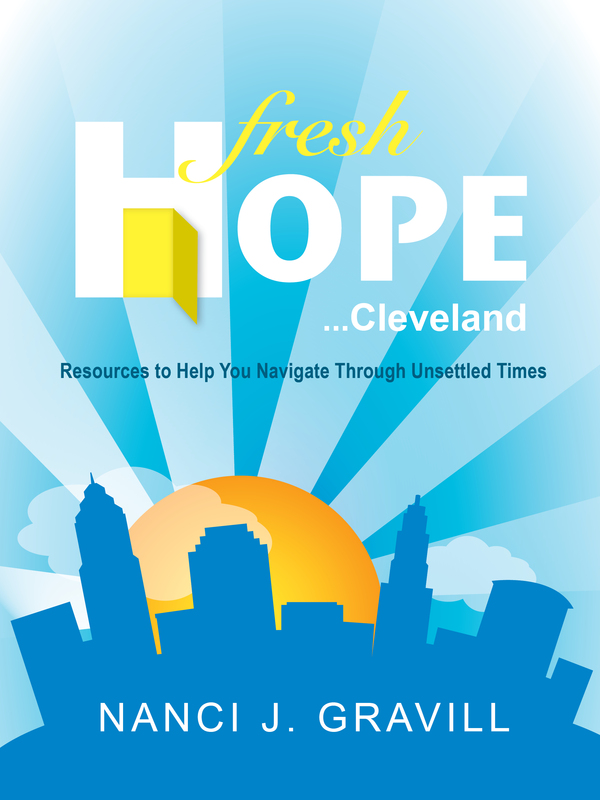 In Fresh Hope…Cleveland author Nanci Gravill shares the resources and strategies that helped her navigate through five years of difficulties.This one-of-a kind guide and workbook shares creative living ideas plus ways to manage your daily challenges. Fresh Hope … Cleveland offers something for everyone and you don’t need to live in Cleveland to benefit from the wisdom it provides! Fresh Hope…Cleveland is published by WestBow Press ~ division of Thomas Nelson Publishers. Sometimes in life it’s a good thing we don’t know what’s ahead. Through a series of events, author Nanci Gravill lost everyone and everything in her life. It all started with breast cancer in late 2003. As she began to recover from this Job-like experience, unable to return to her temporary teaching position, Nanci was forced to live off all of her investments and retirement money. Instead of giving into fear, she called countless community agencies and used her creativity to come up with other ways to stretch the money she had left. She also found healthy ways to deal with her emotions and cope with her circumstances. Above everything else, she put her trust in God. All the resources found in Fresh Hope … Cleveland helped Nanci make it through five very difficult years. They can help anyone find the answers and hope that they need, too. It’s simple. This practical guideand workbookprovides wisdom at a time when it’s needed most. Waiting for answers and opportunities to arrive is part of life. But how will you wait? How will you cope? Fresh Hope … Cleveland offers some inventive ways to manage those challenges, along with money-saving tips, healthcare services, job and mortgage information, and much more. Find out, too, about the most important resource you could ever possess: a relationship with God. More than anything, Fresh Hope … Cleveland provides direction, encouragement, and power people everywhere need to not only survive, but thrive. Nanci, lovely talking with you today at the store. I hope you had time to finish your shopping. Happened to think that my son who has kidney disease might benefit from your book in the future, so I will be purchasing one. Best of luck with this project and with all your future work.